1752 - Scott Free is born on New Genesis the son of the All-Father. he is traded to Apokolips to seal their non-aggression pact. he is raised in Granny Goodness's Terror Orphanages, where he meets Big Barda. 9 years ago - Scott escapes Apokolips to Earth with the help of Big Barda and is taken in by Thaddeus Brown, a circus escape artist. 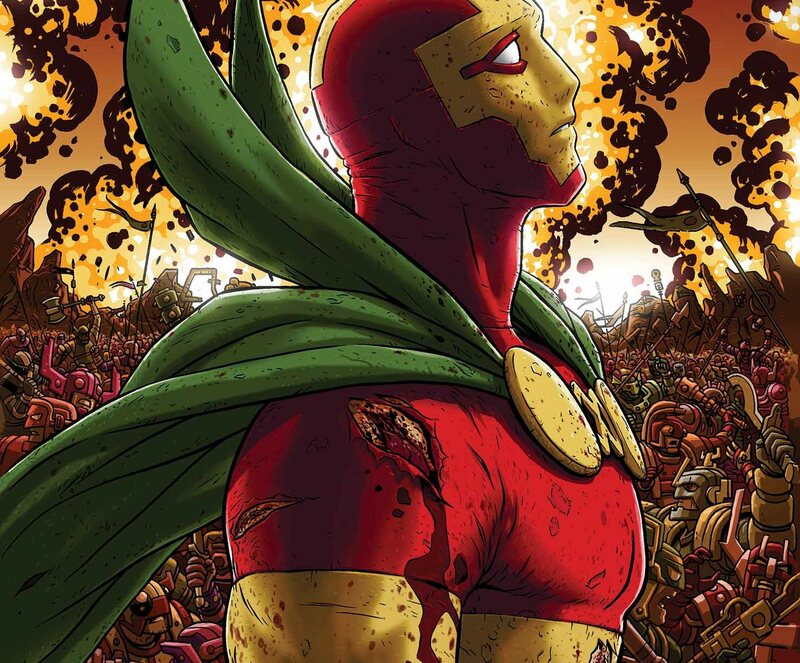 When Brown is murdered, Scott takes on his stage name, Mister Miracle, to solve the crime. 7 years ago - Scott joins the Justice League. 6 years ago - the Female Furies track Scott to Earth where he continually escapes them. Big Barda turns to his side to defeat the Furies. They are married on New Genesis by All-Father, and retire to Earth. 4 years ago - Scott & Big Barda are attacked by a Parademon wave. They return to Apokolips to win their freedom in combat. 2 years ago - Big Barda joins the Watchtower at the request of the All-Father. 1 year ago - Scott helps Big Barda & Watchtower fight Maggeddon. Big Barda gives birth to their son, Shiloh Free. He joins the new Justice League with her. 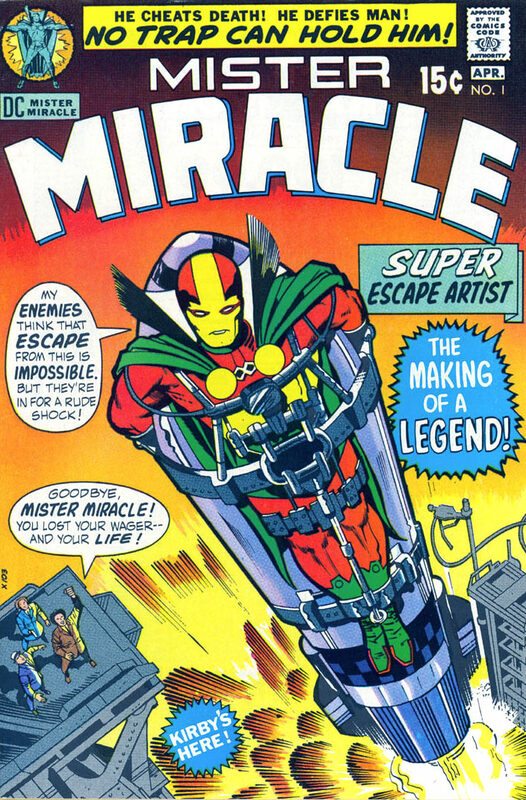 ​Mister Miracle might be the most Kirby-esque character to make it into the DC mainstream continuity. There are other New Gods that have joined the Justice League, most notably his wife Barda, Orion, and even lesser-known characters like Lightray, but none have maintained a steady, humanizing presence on Earth, building a life for themselves. For a lot of people, Mister Miracle represents a real outlier character in the echelon of DC's heroes. He's not exactly mainstream, and trying to explain him to a newcomer requires you to sit them down and explain the entire Fourth World. That sort of complex and insular storytelling isn't an easy sell, but it's also what lifelong fans love in their comics, and once you get into the proper rhythm of these stories Mister Miracle becomes one of the absolute best. He represents a pedigree of creative innovation and complex long-form storytelling that most heroes almost never reach. Mister Miracle was one of three comic series created by Jack Kirby when he foresaw the decline of newsstand sales of comics and somehow prophetically predicted the rise of the graphic novel. He started laying the groundwork of what would become his "Fourth World" story in the pages of Superman's Pal Jimmy Olsen, but went on to continue it in the pages of The Forever People, The New Gods, and Mister Miracle. DC would ultimately not be ready for the idea of a limited series and went on to serialize the adventures of the New Gods, bringing them into their larger world of super-heroes. Miracle, for example, became one of the first New Gods to actually become a member of the Justice League. Specifically, in the pages of Keith Giffen & J.M. DeMatteis, Justice League International. 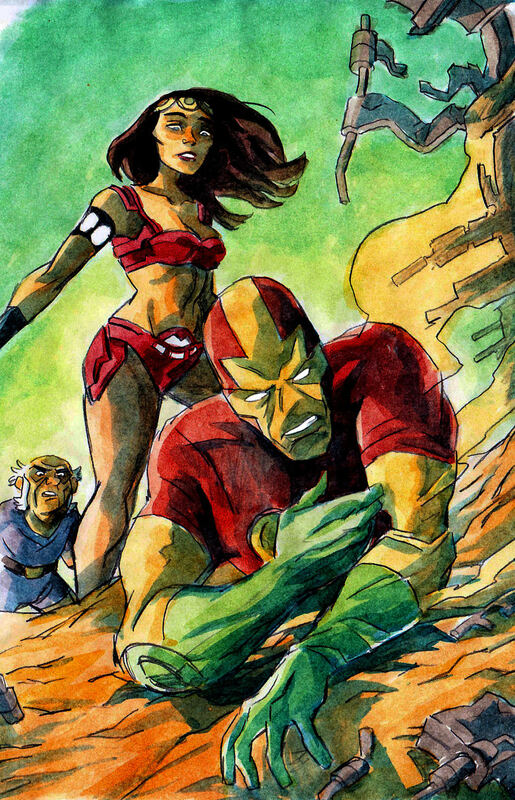 This is where we first get the notion of Barda and Scott living a semi-retired and mostly domestic life together on Earth. A large part of Giffen & DeMatteis's magic was casting their superheroes like much more relatable, fallible people and deriving a lot of humor from it. This idea has permeated almost every other version of these two characters to go afterward, but it's still understood that they are two of the most unique heroes still operating on earth, even if their more immediate concern is making sure the recycling gets taken out. On the surface, Mister Miracle presents a bit of a conundrum. He's a super escape artist. This raises several questions, because it seems like those powers are very situation specific. Apparently, Kirby actually based this on fellow comic legend Jim Steranko who had a previous career as an Illusionist. Once you start thinking of broader applications of the concepts of being a stage magician and understand that Scott Free can apply them on a more cosmic level thanks to his Mother Box, the character makes a lot more sense. It's understood that Free is a genius inventor that has constructed unique applications for an alien technology that he used to escape from one of the most inescapable places in the universe. Without his technology, he's still a New God, he's superhumanly strong and durable (although not quite on the same level as bruisers like Barda or Orion) and received training as an aerotrooper in the Terror Orphanages by Granny Goodness. He's an extremely competent combatant even though he will never choose violence as a first option. When he has his suit, and by extension all of his specialized reality-warping equipment, however, he is capable of performing any number of feats that should be impossible; simply applying his skills as an illusionist and escape artist while manipulating the fundamental laws of physics. This is all true of the character even before we start to look at his backstory, which might be one of the most compellingly constructed heroes in all of comics. But any conversation about the greatest artist and innovator in comics that doesn't end definitively with Jack Kirby is just flat-out incorrect. His influences are so interwoven with the concept of super-heroes that it might be impossible to imagine a modern comic book character without him. His work at Marvel alone is responsible for billions of dollars worth of revenue. Every superhero costume that's ever come from him is an absolute work of art. 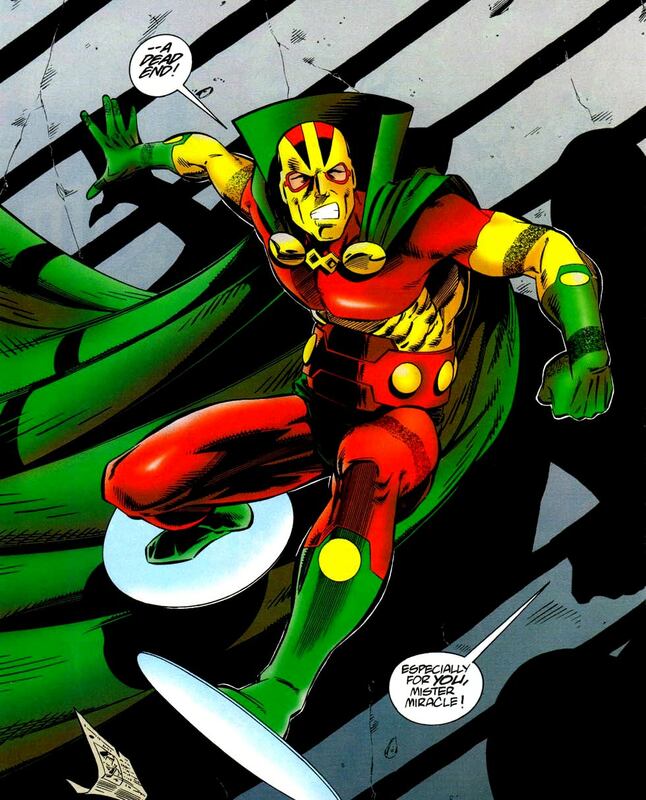 Mister Miracle is a unique design as a superhero; he doesn't defeat his enemies by punching them, he outsmarts them with cosmic science. Kirby's design for his costume is absolutely perfect. It's just a question of how well we can honor that original design. As we leave our timeline, Mister Miracle has married his wife, severed his connections with Apokalips, settled into his life on Earth, become a premier member of the newest version of the Justice League, and has just become a father. It seems his life is actually very much complete. Of course, that really can't ever be the case, can it? Scott Free has a part to play in the narrative unfolding back on his home planet. He is the son of Highfather... essentially the son of God... the adopted son of Darkseid, and in many ways the lost brother of Orion, the future ruler of Apokalips. As the final conflict between the New Gods looms, he will definitely have a role to play. Someday that story will be told, and he will be right at the forefront of it.